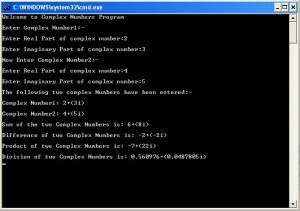 This lab is to introduce students to the concept of operator overloading asÂ member functions of a class. This will be done in the context of creating a class that will perform four basic mathematical operations on complex numbers. The C++ compiler has defined operators for all the arithmetic and assignment operations for its native data types, such as integer, float, double, and so forth. However, for user-defined data types, such as classes and structures, these operations are undefined. C++ allows the programmer to create new definitions for these operatorsÂ so that they canÂ operate specifically on these user-defined data types. Which set of operators is actually called and implemented is decided during the compilation, and it is based on the data types of the operands involved in the operation. 1. Submit a single zip file containing project foldrr to the WeekÂ 6 Dropbox. Your source code should use proper indentation and be error free.Â Be sure that your last name and theÂ lab numberÂ are part of the file name: for example, YourLastName_Lab5.txt. Each program should include a comment section thatÂ includes, at a minimum, your name, the lab and exercise number, andÂ a description ofÂ what the program accomplishes. 2. Submit a lab report (a Word document) containing the following information to the Week 6 Dropbox. •	Include your name and the lab or lab exercise number. •	Specification: IncludeÂ a brief description of what the program accomplishes, including its input, key processes, and output. •	Test Plan:Â Include aÂ brief description of the method you used to confirm that your program worked properly.Â If necessary, include a clearly labeled table with test cases, predicted results, and actual results. •	SummaryÂ and Conclusions:Â Write a statement summarizing your predicted and actual output, and identify and explain any differences.Â For conclusions, write at least one nontrivial paragraph that explains, in detail, either a significant problem you had and how you solved it or, if you had no significant problems, something you learned by doing the exercise. •	A UML diagram:Â This should show all the classes, class members, access specifiers, data types, and function arguments, along with any and all class-to-class relationships. •	Answers to Lab Questions:Â Include the answers to any and all lab questionsÂ asked in the lab steps. Each lab exercise should haveÂ a separate section in the lab-report document. Create a new multifile project, and create a class to model complex-number, mathematical operations using overloaded operators and add main() test functions to test the operations. 1. Create a class for complex numbersÂ that will provide the means to store both the real and the imaginary values of a complex number. 2. Design and add overloaded operators to perform correct andÂ complex mathematical operations on objects of the complex-number class. 1. 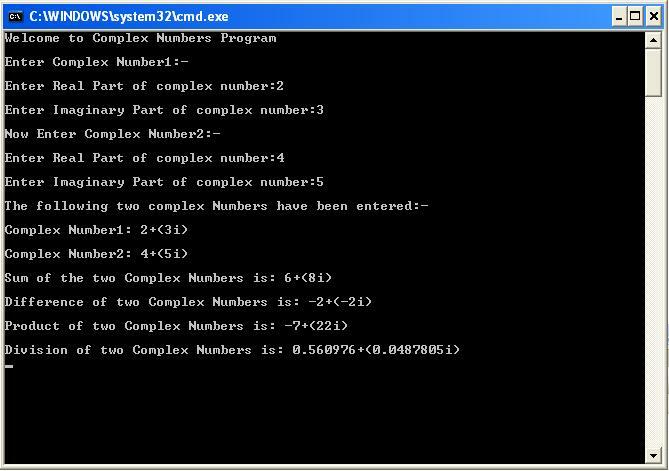 Overload the addition operator (+) to perform complex mathmatical addition on two objects of the complex-number class. 2. Overload theÂ subtraction operator (-) to perform complex mathmatical subtraction on two objects of the complex-number class. 3. Overload theÂ multiplication operator (*) to perform complex mathmatical multiplication on two objects of the complex-number class. 4. Overload theÂ division operator (/) to perform complex mathmatical division on two objects of the complex-number class. 5. Overload the assignment operator (=) to assign all the data values of an objectÂ in the complex-number class to another objectÂ in the complex-number class. Create at least three objects of the complex-number class in function main() and use them to perform the following operation tests. 1. Demonstrate the correct operation of the complex addition overloaded operator. 2. Demonstrate the correct operation of the complex subtraction overloaded operator. 3. Demonstrate the correct operation of the complex division overloaded operator. 4. Demonstrate the correct operation of the complex multiplication overloaded operator.